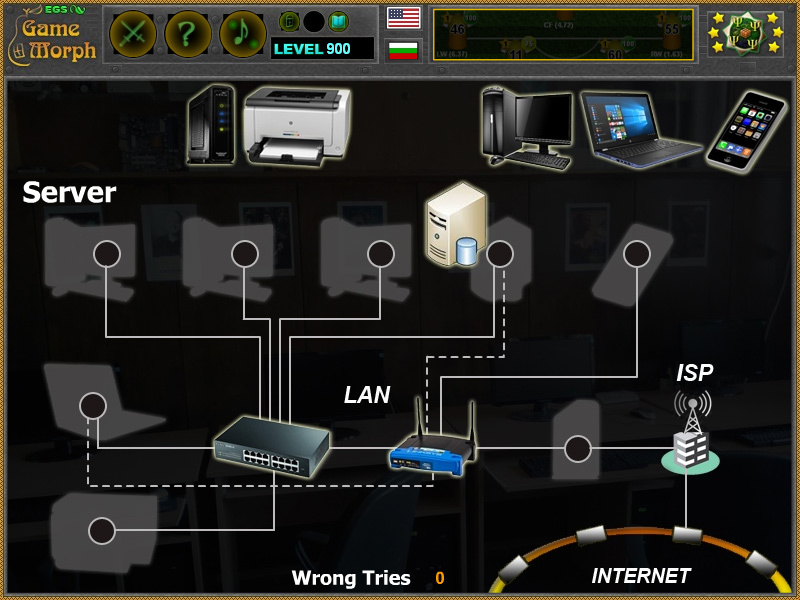 Parts and devices of Local Area Network in a fun online IT learning game. 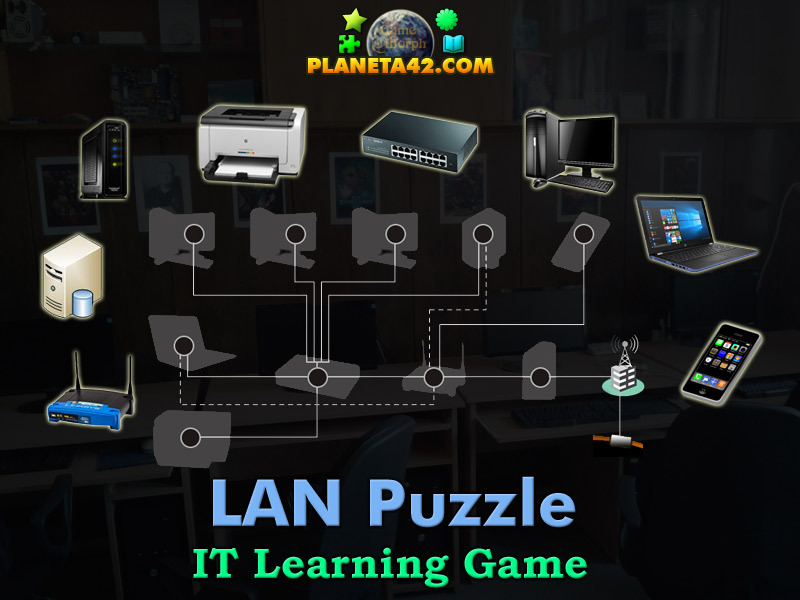 The LAN Structure Puzzle is a free online knowledge level game, about the Local Area Network function and structure. Drag and drop the LAN parts in their correct places on the diagram. Minute to win it game. A small Computer Science Class puzzle for desktop computers, laptops and tablets, which may be played in the web browser. The IT Knowledge Board include 8 LAN devices to play with. What are the Local Area Network parts? How are computers connected in Local Area Network? Is the Router before the switch or not? Do I connect the Server in the Switch or in the Router? How are network printers connected? What is the function of the Modem? Where is the switch situated in the LAN? How to play LAN Structure Online Puzzle. There are 8 pictures of hardware devices over the blank diagram of a Local Area Network. Drag and drop them in the designated places to win the game. The tries counter is used for evaluation, 0 wrong tries for "A". Know 5 parts of a Local Area Network and get +1 Knowledge Level. As for 2017 majority of people have more than one computing device at home - computer, laptop, phone or tablet. Connecting them all togather we create a LAN, and all the LANs in the world, form the Internet. Local area networks may also connect computer halls, offices or neighbours. Connecting 2 and more neighbourhoods we have a WAN - Wide Area Network. And connecting a whole city we have a MAN - Metropolitan Area Network. 1. Router - A router is a networking device that forwards data packets between computer networks. Routers perform the traffic directing functions on the Internet. It also generate IP adresses for other computers connected in the LAN. 2. Server - In computing, a server is a computer program or a device that provides functionality for other programs or devices, called "clients". Servers can have various functions, from hostinga a website, to simple online data storage. 3. Modem - A modem is a network hardware device that modulates one or more carrier wave signals to produce a signal that can be transmitted easily and decoded to reproduce the original digital data. If no cabel connections is possible, modems are used to connect a LAN to the ISP(Internet Service Provider). 4. Pinter - Network printers are often used in corporations. 5. Switch - A network switch, also called switching hub or bridging hub, is a computer networking device that connects devices together on a computer network by using packet switching to receive, process, and forward data to the destination device. 6. Computer - A computer is a device that can be instructed to carry out arbitrary sequences of arithmetic or logical operations automatically. 7. Laptop - A portable computer. 8. Mobile Phone - Any modern mobile phone - iPhone or tablet can connect to internet through a Wireless WI-FI router. 9. Internet Service Provider - An ISP is an organization or company that provides services accessing and using the Internet. Labels: Games about Computers , Puzzle Games , Flash Games , IT Games , Education Games , Computer Science Class Games.